One person who offered to sit for me was a chap called Ray. Partially sighted, he uses a white stick and began attending my studio about two years ago. Ray’s story goes on, we meet regularly. Raymond grew up in the City of Bath. During the Second World War, his father was conscripted into the Army and went to fight overseas, leaving Ray’s mother to raise him and his siblings. In the early phases of hostilities, the Luftwaffe (German Air Force) bombed cities and urban conurbations throughout the UK. 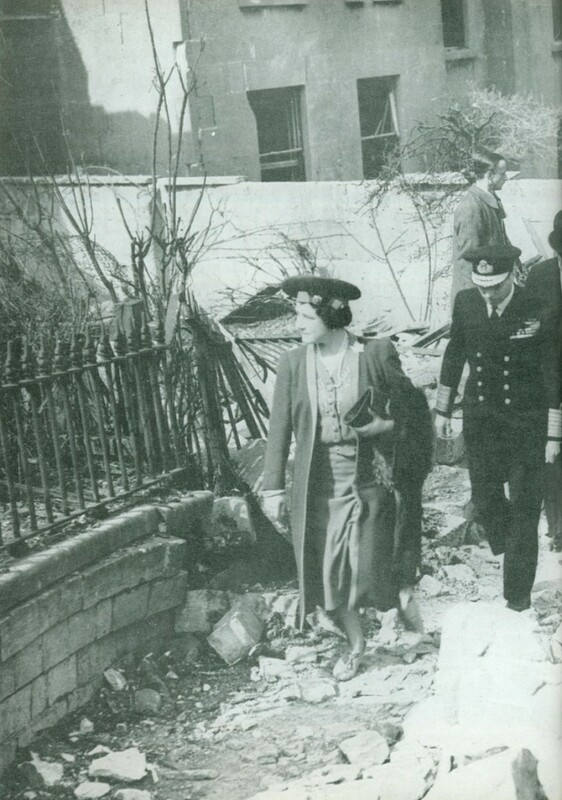 This photo shows members of the Royal family surveying bomb damage in Bath. To the left of the Queen Mother can be seen some wrought iron railings – indicating the time of the circumstances. Bath was blitzed on the 25th and 26th of April 1942. Churchill and his government cut red tape restricting British industry in the production of military aircraft. This gave Lord Beaverbrook carte blanche to sequester any sources of metal required, including kitchen utensils and railings outside properties. Ray was about nine years old when an unfortunate, seemingly inconsequential event took place. He was playing with other boys in his street when one of them cut his knee. Ray got a plaster from his mother and sat down on the low wall of a nearby property to administer first aid. As he pushed the plaster onto his mate’s wound, he toppled backwards and fell into the basement of the property, landing on his head. The railings which he originally knew to be there were gone, removed by the MOD for the purposes of aircraft production. Not long after, Ray’s mum began to notice his long distance vision wasn’t as good as it used to be. Working as a project manager in the construction industry, in his early fifties Ray had a sudden and dramatic loss of vision caused by irreversible damage to his primary visual cortex, when he kindly administered first aid to his friend – glaucoma has compounded his disability. In the light of this, it is difficult to have faith in the law of Karma. A businessman would reason with ‘the balance sheet of death’; Nietzsche would discount such loss as the price of Britain’s moral greatness. When we were busy rebuilding West Germany and repaying the Americans for Lend-lease munitions, we didn’t bargain on the long term costs inflicted on our society; there are many examples of the way in which ordinary British citizens have continued to pay more than the price of ‘winning the war’ in its aftermath. Ray soldiers on. He makes use of himself as a model for me. In this portrait I made a more searching study of his face, choosing a direct view. I did a line drawing and transposed this onto prepared board, doing all the painting from life. No photo’s were used. I worked with a straight oils technique. The painting is better than the first study I made of Ray. It shows his lack of sight, he wasn’t always easy with me staring into his face. I make him cups of coffee and we have our parliament. As successive generations pass on we should do all we can to revere their contribution to our present lot. 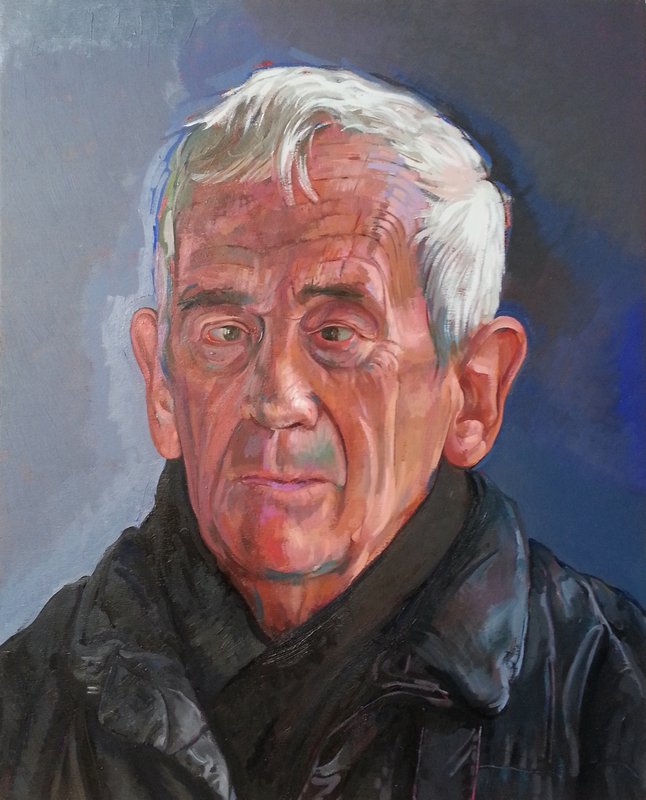 This painting by Alan Dedman records and celebrates the stoicism of a single British citizen. The above work is 16″ x 20″ in size. It is framed with a floating slip and silver moulding.